Are your kids getting tired of the regular matching games I’ve been sharing for a few months now? N still likes them, but he’s become very interested in clothespins and he’s now ready for clip cards. I think that’s awesome because they’re great for incidental fine motor practice while working on other learning objectives. I offer a lot of clip cards for more advanced topics (like counting, beginning sounds, addition, positional words, and more) but now I’m branching out into toddler themes! 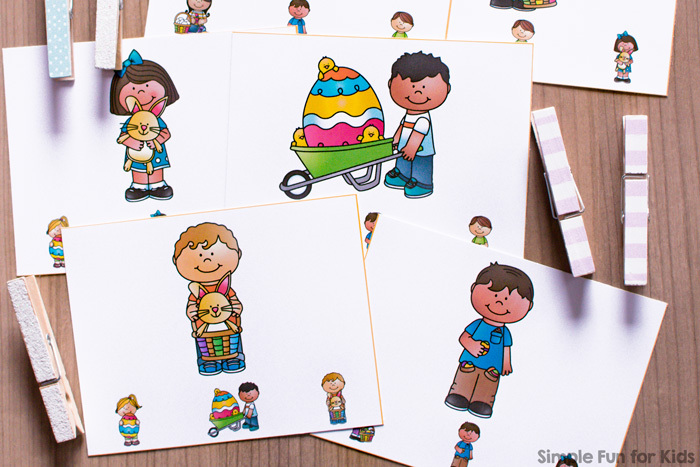 Today, I have a set of eight Easter Kids Matching Clip Cards that go perfectly with the Easter Kids Matching Game for Toddlers I shared the other day. 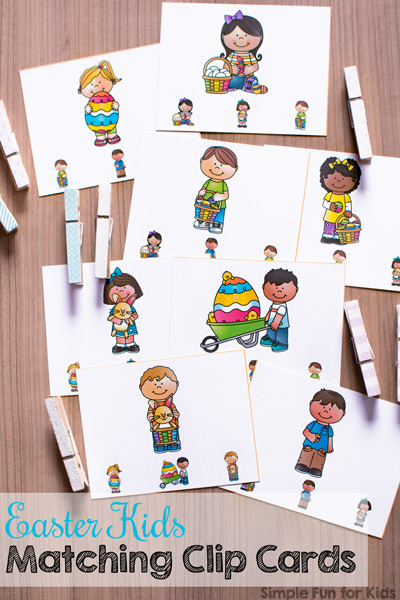 Each clip card features a large colorful image of a kid with Easter eggs, a bunny, a basket, and other Easter-themed items. At the bottom, there are three smaller similar images, and one of them matches the large image. The objective is to mark the matching image with a clothespin. Print out either one or both pages, laminate them for better durability, and cut the clip cards apart at the yellow lines. Easter Kids Matching Game for Toddlers and Advanced Easter Cutting Practice Puzzles use the same set. Want more Easter activities? Here are a few others I’ve picked out for you!